This past weekend was a much-welcomed break from the chills of winter. I did my best to take full advantage of the warm, sunny days by venturing into some of my favorite neighborhoods and even did some mid-afternoon reading at Union Square Park. Looking around, you could tell everyone else had the same idea too. The sidewalks were more crowded than I’d seen them since Super Bowl weekend. Of course, all of that walking gave me plenty of time to think too. As I strolled through the Meatpacking District in Manhattan, I came across the High Line—a section of repurposed train tracks that now houses a gorgeous public green space. It instantly reminded me just how many projects are in progress to transform NYC into a city of tomorrow. It’s too common that NYC gets a bad rap for being dirty and overcrowded. Sure, that may ring true for some areas of the city, but that can be said about any major metropolitan area. I’d argue that now, more than ever, the city and several private companies are trying to shed these preconceptions with a variety of green space and tech developments aimed at attracting more young professionals to the area. We’ve already seen the addition of new bike lanes and public spaces in areas such as Times Square, but those only scratch the surface of what this city has planned for the future. 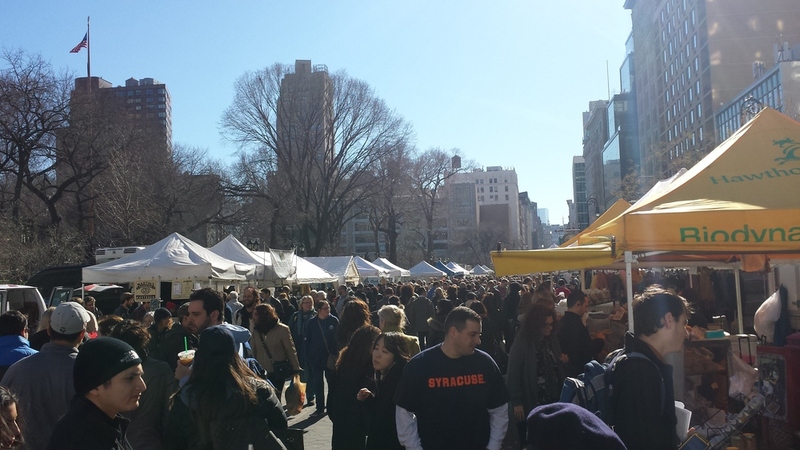 The weekly Farmers' Market at Union Square Park. The Low Line, which takes its cues from its sister High Line, is billed as the world’s first underground park. Utilizing innovative solar technology, the project aims to transform an historic trolley terminal into a stunning park underneath the Lower East Side. Although negotiations are still underway, several elected officials support the project, which is looking to complete construction in 2018. Roosevelt Island, that weird space under the Queensboro Bridge, is being transformed into Cornell Tech’s new campus through a joint partnership between the city and Cornell University. Designed to be one of the most forward-thinking campuses in the US, the new Cornell Tech will be utilized to fast track tech careers in the area, encourage a greater presence from tech companies in the city overall, and provide a space to explore the potential of tomorrow’s tech. These are just a few of the innovative investments the city and its partners have made recently. From the expansion of the LIRR with East Side Access, to the area-wide rollout of Citibike, New York City is ensuring it’s not left in the dust when it comes to attracting lucrative start-ups and young professionals. While there’s still a long way to go, it’s encouraging to see the city make such a sweeping effort to lead the future. I actually saw Cleveland making similar motions before my departure too. It goes to show that even if a city isn't your best fit now, you should always keep an eye on where it’s going. In the end, it might turn out to be a good place to call home after all.